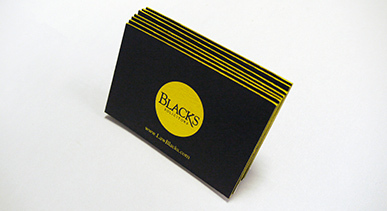 There are many varied ways of making your business cards stand out from the crowd. At Kolorco we have a vast experience of doing just this. The cards are a great example of Kolorco sharing this knowledge and experience with one of our clients. These triplexed cards were initially printed with a double hit solid black onto Colorplan Factory Yellow, 270gsm board using our in- house Indigo digital printing capability. The reverse was then overprinted litho in metallic silver. The 2 separate outer Yellow boards are sandwiched either side of a black centre board to separate the printed stock and create a visually interesting edged profile. Having digital, litho and in- house finishing makes Kolorco ideally equipped to produce this type of project from start to finish.